Vassilis E. Kertsikoff is Vice-Chairman of family-owned Eletson which he joined in 1991 and the Chairman & CEO of Eletson Gas, a recently-established joint venture between Eletson & the Blackstone Group. He previously served as the CFO of Eletson where he was instrumental, among others, in raising debt facilities from various international sources, including the first ever high-yield bond by a European issuer in the US market. Mr Kertsikoff’s background is shipping, international corporate finance and fund management. Apart from his shipping activities, he is a leading real estate investor in Greece and Central & Eastern Europe, has private equity interests in Greece and elsewhere and holds a directorship in various corporate and real estate entities. 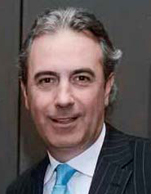 Vassilis E. Kertsikoff holds a Bachelor of Arts degree in International Relations from Princeton University and a Master of Business Administration in Finance from New York University.